Ai Wei Wei’s latest art production is Human Flow, a documentary movie about what is termed as the biggest mass human migration since World War II—65 million people in 2015-2016 alone—when the film was produced. It officially opened on October 20, 2017. At the heart of it is what it means to be undocumented today. Given the abnegation of homeless people by the establishment, the silence can be deafening. And the continuing denial…stupendous. Here, the overall affect is more discursive than plot-driven, inviting the movie-goer to think, feel, and most of all, question why this is really happening and how universal homelessness can be. The film dares us to visualize the scope and scale of the global refugee crisis and to experience the courage and tenacity of the human spirit. We are struck by the fact that these outcasts can still laugh, sing, cry, and not be deeply angry or resentful, as the establishment frequently makes them seem whenever any refugee commits a crime. Sculpturist and visual artist Ai Wei Wei has made his reputation over the past decades as one of China’s most famous dissidents. He is best known for his intricate “Bird’s Nest” Stadium built for the 2008 Summer Olympics in Beijing. He has himself experienced the perspective of an exile. My work is always dealing with real or fake, authenticity, what the value is, and how the value relates to current political and social understandings and misunderstandings. So many layers of information, so many threads to chase, where can we go from here? The effects are reminiscent of Chinese watercolor, tinged with a mix of the human and the profane, containing both the real and the esoteric. Echoing Asian literary tradition the presentation contains abstract scenes threaded with verse, such as from Persian poets. The mostly silent newsreels are strung together as a tapestry that makes the movie time of 2-1/2 hours fly by. They are punctuated with captions from the New York Times or Washington Post, and interviews with experts, and officials from the U.N., and most important, with the variety of refugees themselves in almost whatever state or encounter. The effect strikes one of a flowing, personal view of events even with the swift change in scenery at times. Interestingly, Ai Wei Wei interposes himself at different locations, perhaps to help convey the sense of persona. Overall, there’s a visible stoicism, yet loneliness and longing for home and place that permeates the heart and soul of even the most hardened wayfarers. The contrasts evoke my past reading of the Human Comedy, a novel by William Saroyan. At a film-screening in Washington on Sept. 25, whose audience included Congressional Rep. Ted Lieu (D) and Rep. Randy Hultgren (R), Ai Wei Wei confided that time and again he wanted to emphasize the homeless refugees’ desperation and humanity. The most difficult part is when you’re filming these images, you see these people desperately need some understanding. It’s not really they need money or some kind of support. They really need people to look at them and see them as human beings. As the blue sky is broken up by the cry of migrating birds so the drone-camera floats over swathes of people traveling on foot to Germany. 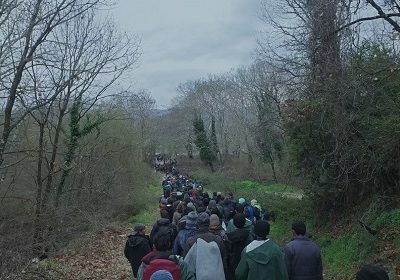 The documentary opens with a joyful boat landing of Syrian refugees to Greece, but becomes suspended by prison-like footage of razor-edged fences, vicious dogs, and armed guards beating refugees back with batons. Human Flow touches the heart precisely because the new waves of refugees are some of the most undocumented grossly misunderstood people on the face of Earth today. In fact, one has to go back to the root of the problem. Why must these people leave their homelands? Is it war or climate change? Is it civilian strife or religious indifference? If there is a political message at all, it is that much more needs to be done, even if it amounts to setting up permanent UNICEF camps such as in Lebanon, where at least a fraction of the refugee children are allowed the opportunity to attend school regularly and perhaps to experience a place called home for a few years. The film credits include scores of participants whose contributions include production, camera work, serving as writers, interviewees, researchers, translators, and hosts. The writers traveled to a multitude of countries including Greece, Hungary, Turkey, Germany, Lebanon, Jordan, Gaza, Egypt, Algeria, Afghanistan, Burma, Mexico, and the United States. The movie is co-produced by Chin-Chin Yap, Tom Finch, and Boris Cheshirkov.